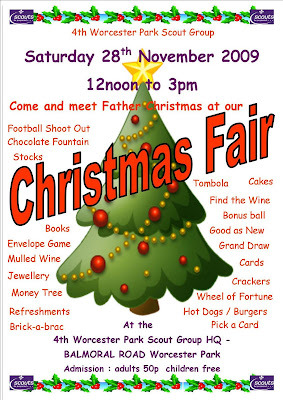 It's 'Christmas Fair' time, and if you're in Worcester Park this Saturday you will be well and truly spoiled for choice. The 4th Worcester Park Scout Group is holding their annual Christmas Fair from 12.00 – 3.00pm on Saturday (28 November) at their HQ in Balmoral Road. Meet Father Christmas, buy a ticket for the Grand Draw to see if you can win an iPod Touch or a digital camera, buy something on the ‘Good As New’ stall, or try out the Chocolate Fountain and ‘Find the Wine’. Admission is 50p for adults, children free. St Cecilia's School on London Road are also holding their Christmas fair on Saturday from 1-4pm, and the Royal British Legion are holding their event from 11am at their premises on Central Road. Finally for this Saturday, Linden Bridge School on Grafton Road, Worcester Park are holding their Christmas Fair from Noon to 3pm.